Greenhouse films are used to cover the frame of crops which are cultivated in the greenhouse. It provides the protection of crops from adverse weather conditions and suitable farming conditions. It protects from the weather condition such as heavy rain, strong wind, fluctuating temperature, and snow. The selection of film is based on the area where crops are cultivated and its weather requirement. Governments in the numerous countries are struggling to avoid losses due to the improper employment of greenhouses plant cultivation. The governments such as India, Poland, and Canada are encouraging farmers to adopt the different types of greenhouse films by offering some subsidies for electricity and resources used in the greenhouse. The kit and other supplements are required for heating and ventilating for maintaining the temperature of crops. Thus, the adoption of these greenhouse films is higher especially in the region where major temperature fluctuations occurred – the places such as deserts. In the particular region, the film offers a suitable temperature for the crop which is difficult to grow due to outdoor temperature. The aforementioned factors are boosting the adoption of greenhouse films and likely to influence positively on the growth of the global greenhouse film market. However, employment of greenhouse requires additional expenditure such as temperature maintenance kit and labor cost which are restraining growth of the greenhouse film market. Nonetheless, the growing trend of cultivating of the out-of-season crops in the greenhouse is expected to propel growth for the next few years as the crops are a good source of income for farmers. 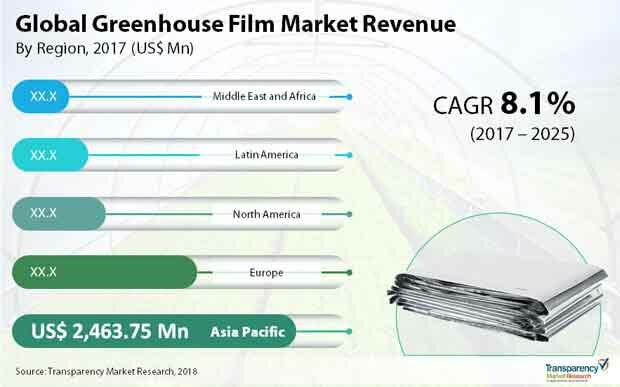 According to the TMR, the global greenhouse film market is expected to expand with 8.1% CAGR over the forecast period from 2017 to 2025 to reach a value of US$6,900 mn by the end of 2025. On the basis of the thickness, the global greenhouse film market is segmented into less than 100 microns, 101 - 150 microns, greater than 150 microns. Of these, films with a thickness of more than 150 microns segment are dominating the global market for greenhouse films. This growth is attributable to the higher adoption of thick films by farmers. On the basis of application, the global greenhouse film market is segmented into flowers and ornamental, vegetables, and fruits. Of these, flowers and ornamental segment dominate the global market for greenhouse films in 2016. The flowers and ornamental plants are mainly cultivated in the greenhouse; thus, their adoption is higher which is fuelling the growth of the segment. On the basis of region, the global greenhouse film market is segmented into North America, Asia Pacific, Europe, Latin America, and the Middle East and Africa. Of these, Asia Pacific dominated the market for greenhouse film in 2016 and is expected to continue its dominance over the forecast period. The region is expected to expand with healthy CAGR over the forecast period owing to the availability of land to employ greenhouse to grow out-of-season crops in order to fulfill the need for demand from the population. Some of the key players operating in the greenhouse film market are Berry Global Group, Inc., RPC BPI Group, BASF SE, Barbier Group, and RKW Hyplast NV. The market has highly fragmented vendor landscape owing to a high number of the acquisition and mergers. These companies have accounted for less than 40% shares of the overall market in 2016. Greenhouse films are used to cover greenhouse structures in order to generate suitable conditions for cultivation of crops against adverse environmental settings. The global greenhouse films market can be segmented based on type of resin, thickness, application, and geography. In terms of type of resin, the greenhouse film market can be divided into LDPE, EVA/EBA, LLDPE, PVC, and others. LDPE accounted for a significant share of the greenhouse film market in 2016. Based on thickness, greenhouse films with thickness of more than 150 microns constituted a leading share of the greenhouse film market in 2016. Applications of greenhouse films include cultivation of vegetables, flowers & ornamental plants, and fruits. Increasing greenhouse cultivations owing to the rising need for appropriate environmental conditions is a major driving factor for the growth of greenhouse films. These conditions play a crucial role in increasing the yield of crops. Crops such as tomatoes, lettuce, basil, and cucumbers grow outdoors only during a specific period in the year. These crops command high prices commercially. Greenhouse films used in greenhouse structures help in cultivation of these crops during their off-season. However, there is an additional investment involved in the process, such as heating of the greenhouse during winter, labor cost, etc. Asia Pacific dominated the global greenhouse film market in 2016 and is expected to witness a significant growth of the market during the forecast period. Asia Pacific was followed by Europe in terms of revenue and volume of the greenhouse film market in 2016. In Latin America, Mexico and Brazil were the major markets for greenhouse film in 2016. The trend is expected to continue during the forecast period. Middle East & Africa is considered an attractive market for greenhouse films owing to the rise in greenhouse cultivation in Israel, Iran, and Turkey. This report analyzes and forecasts the greenhouse film market at the global and regional level. The market has been forecast based on volume (kilo tons, tons) and revenue (US$ million, thousand) from 2017 to 2025, considering 2016 as the base year. The study includes drivers and restraints of the global greenhouse film market. It also covers the estimated impact of these drivers and restraints on the demand for greenhouse film during the forecast period. The report also highlights business opportunities for the greenhouse film market at the global and regional level. The report includes detailed value chain analysis, providing a comprehensive view of the global greenhouse film market. Porter’s Five Forces model for the greenhouse film market has also been included to help understand the competitive landscape of the market. The study encompasses market attractiveness analysis, wherein end-users are benchmarked based on their market size, growth rate, and general attractiveness. The study provides a decisive view of the global greenhouse film market by segmenting it in terms of thickness – <100 microns, 101 - 150 microns, >150 microns; resin type – LDPE, EVA/EBA, LLDPE, PVC, others; and application – vegetables, flowers & ornamental, fruits. These segments have been analyzed based on present and future trends. Regional segmentation includes current and forecast demand for greenhouse film in Asia Pacific, Europe, North America, Latin America, and Middle East & Africa. The report provides the actual size of the greenhouse film market in 2016 and the estimated size of the market for 2017, along with forecast for the next eight years. The global market size has been provided in terms of volume and revenue. Volume has been defined in kilo tons & tons, while revenue in US$ million & thousand. Market numbers have been estimated based on key applications of greenhouse films. Market size and forecast for end-users have been provided at global, regional, and country levels. The report comprises profiles of major companies operating in the global greenhouse film market. Key players include Berry Global Group, Inc., BASF SE, RPC BPI Group, Barbier Group, RKW Hyplast NV, and Plastika Kritis S.A. Market players have been profiled in terms of attributes such as company overview, financial overview, business strategies, and recent developments. The greenhouse film market is mainly concentrated in Asia Pacific and Europe. The Middle East is generating considerable revenue as Israel and Iran are adopting greenhouse cultivations extensively. Fruits grown on trees cannot be cultivated in greenhouse. Only strawberries and muskmelons are cultivated in greenhouses as they are creepers.